The comments by the Chinese Foreign Ministry came as New Delhi and Tokyo sought to firm up their close ties during Japanese Prime Minister Shizo Abe's visit to India. Ms Hua was replying to a question about Mr Abe's visit to India. 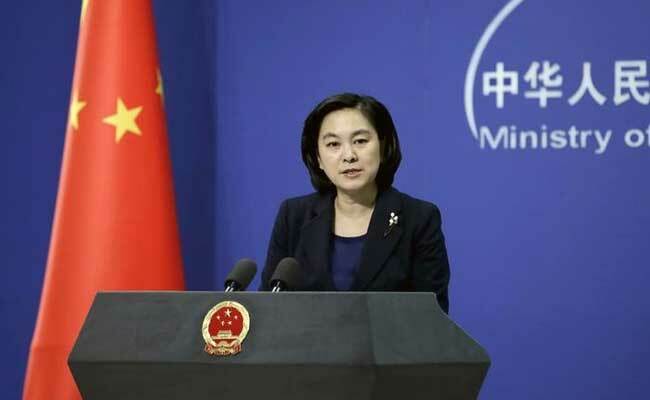 Ms Hua, however, declined to comment on specific issue like Japan's plans to sell US-2 amphibious aircraft to India, saying she would like to wait till a detailed readout from the two countries following a meeting between Abe and Prime Minister Narendra Modi. Japan's plans to sell the amphibious aircraft to India raised eyebrows here as this is first such move by Tokyo to sell defence equipment to any country. China is also concerned about Japan getting the first bullet train project in India between Ahmedabad and Mumbai. China and Japan also have a longstanding dispute over islands in the East China Sea. Chinese ties with Japan have also been strained by what Beijing see as Japanese leaders' reluctance to atone for the country's wartime past. Ms Hua said China will "stay open and welcome normal development of relations between the countries in the region", as long as they are conducive to peace and stability in the region. Commenting on Abe's visit to India, Chinese think-tanks expressed concern over the "Freedom Corridor", as well as several joint infrastructure projects being launched by India and Japan together in different countries as strategic move by the two countries to counterbalance China's ambitious multi- billion Belt and Road Initiative (BRI). The Indo-Japanese initiative, called the 'Freedom Corridor', stretching from Asia-Pacific to Africa, aims at stabilising the region. "The Freedom Corridor, designed to serve as a counterbalance to China's BRI is expected to figure prominently in talks between Abe and Modi," Hu Zhiyong, a research fellow at the Institute of International Relations of the Shanghai Academy of Social Sciences told state-run Global Times today. The Chinese analysts also referred to report that India and Japan were embarking on multiple infrastructure projects across Africa, Iran, Sri Lanka and Southeast Asia in what could be viewed as pushback against China's unilateral infrastructure initiatives connecting it with Europe and Africa. "Though India objects to CPEC, India's real reason is that it doesn't want to see China's influence in South Asia and refuses to open its domestic market to China," Ye Hailin, director of the Chinese Academy of Social Sciences' National Institute of International Strategy, said. Also the Global Times tabloid, in an editorial titled 'India-Japan intimacy no threat to China' said "in a changing world, the India-Japan intimacy is more like a contrivance". "Under the international relations logic of the 21st century, closer India-Japan ties won't pose grave threats to China because many of their emotional moves to console each other won't produce any real effects in challenging China," it said.